Althea in collaboration with Titi Kamal, an Indonesian Star introduces its new creation, sweet and elegant daily body mist, inspired by her stylish yet comfort style. Althea did many first this year including their very first celebrity collaboration with Titi Kamal, who is both a movie star and singer from Jakarta, Indonesia. 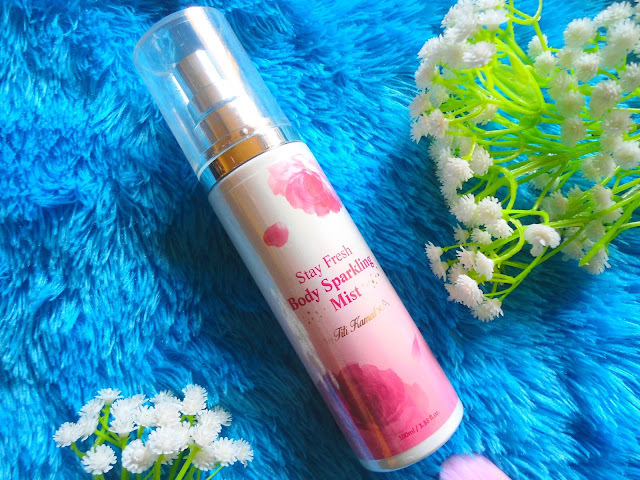 With this collaboration, they launched their very own Althea Stay Fresh Body Sparkling Mist on top of many other products. How I wish I can one day collaborate with a scent company and launch my own unique blend of body mist too! Well... maybe one day! Who knows? I love body sprays as they are not overpowering but at the same time keeps me feeling feminine. Filled in this pink floral bottle is a light-weighted mix of fruity and floral scents of orange, peach and rose. These are Titi Kamal's favourite scents. Small enough to fit into your handbag, bring it along with you and keep yourself smelling fresh all day long. Just like any other body mist, spritz it on your wrist and all over your body anytime you want, this product is suitable for daily use. As it is so light, you can even spray it around you as an air freshener if you feel extravagant enough. Or perhaps, use it as a room spray just before you romance your partner. I personally love the light and long lasting fragrance as it suits any occasion and is not too sweet which makes me want to avoid it. In terms of aesthetics, I felt that it would look really classy if it was packaged in a glass bottle. Nonetheless, it's fine if it comes in a plastic bottle because it is lightweight enough to bring on the go. You can pack the body mist in your travel carry-on or bring it to the office in your handbag. As its name suggests, stay fresh wherever you go!